/Will 4D Technology be the Next Big Thing in Cinema? Will 4D Technology be the Next Big Thing in Cinema? 3D technology has transformed the modern-day cinema experience. By enhancing the illusion of depth perception, three-dimensional films increase audience involvement and improve the viewing experience. They have grown so immensely in popularity over the last few years, the technology is now being used in TVs, video game systems and even cell phones. 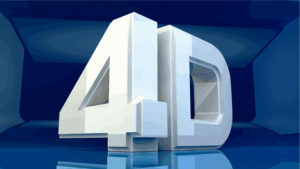 But now that there is 4D, will 4D technology be the next big thing in cinema? But there’s a new player on the market: 4D technology. The question is, will it be the next big thing in cinema, or will it be a passing fad? Unlike what its name suggests, 4D films are not actually, geometrically, 4-dimensional. Rather, the term 4D describes an entertainment presentation system combining a 3D film with physical effects in the theatre, which occur in synchronization with the film. These simulated physical effects may include movement, vibration, strobe lights, wind, water and even smell. While you’re watching a movie that mimics a trip out in the ocean, the nozzle in your chair might spray out a mist of water. Watching a movie about street racing? The nozzles might pump out the smell of burning rubber. Seats in the theater are movable as well, so when a car crash happens on the screen it can also feel like it’s happening in your chair. Large fans positioned around the theater can make you feel like you’re caught in a windstorm, and massive lights located around the theater can be used to create huge flashes like you might see in a lightning storm. While the first movies are now being produced in 4D, some critics are questioning whether the new technology will detract from the viewing experience, rather than add to it. Others are wondering whether cinemagoers are willing to spend the extra dollars at the box office. Why & How You Should Clean Your Cinema Screens →← Why do we need cinema stage curtains?